BHU PET Application Form 2019 – Banaras Hindu University has closed the application window of BHU PET 2019 application form on March 16, 2019. The application form of BHU PET 2019 was released on February 10, 2019. The admit card of BHU PET 2019 will be released one week before the entrance examinations.The mode of BHU PET application form 2019 was online, while the application fee could be filled in both online and offline mode. Candidates who seek admissions into PG courses like M.A., M.Sc., M.Com. offered by the university were required to fill BHU PET 2019 application form. Candidates were required to fill important details like name, phone number, DOB, address, course applied for, etc. on the application form of BHU PET 2019. Candidates were also required to fill in correct details on the BHU PET application form 2019 and cross-check them before submitting it. Once he/she submits the application form of BHU PET, the candidate will not be able to rectify the errors. Candidates had to register themselves first to fill the application form of BHU PET 2019. BHU PET 2019 will be conducted between May 12 to May 21, 2019. BHU PET 2019 candidates can check below to find important details related to BHU PET application form 2019 like application dates, procedure to fill the form, fee structure, and so on. Candidates can refer to the table below which lists down the important dates related to application form of BHU PET 2019 so that they do not miss out any important event. BHU PET for M.A., M.Sc., M.Com. Before filling BHU PET 2019 application form, candidates must thoroughly go through the below mentioned eligibility criteria for M.A., M.Sc., M.Com. courses. BHU PET 2019 candidates must ensure that they fulfill the eligibility criteria for their respective courses and categories. If a candidate is found to be not fulfilling the eligibility criteria, his/her application form for BHU PET 2019 will be cancelled even at later stages of admission. Candidates must have done their B.A./B.A (hons.) in 10 + 2 + 3 pattern from a recognised university and secured a minimum aggregate of 50% (excluding those subjects which do not add up to the final marks in the mark sheet). Candidates must have studied the subject to which they seek admissions into at graduation level. Candidates should hold a B.A./B.Sc./B.A. (hons.)/B.Sc. (hons.) degree from a recognised university. They must have secured 50% as minimum aggregate of the subjects adding to the total marks on the final marksheet. They should have studied the subject they are applying for at graduation level. Candidates should have graduated with 50% as a minimum aggregate in B.Com. (hons.)/B.Com.(hons.) Financial Markets and Management (10 + 2 + 3) pattern. The aggregate should include only those subjects which add to the final score in the marksheet. The subject applied for must have been studied by the candidate at graduation level. Candidates must have studied B.Sc./B.Sc. (hons.) in 10 + 2 + 3 pattern and secured 50% as a minimum aggregate. The aggregate must include the marks of only those subjects that add to final score on marksheet. The subject applied for should have been studied by the candidate at graduation level. *There are relaxations offered by the university for certain categories. Candidates are to keep the following documents handy while filling the application form of BHU PET 2019. Careers360 provides a step-by-step break up of filling the application form of BHU PET 2019. Candidates are required to go through the below mentioned steps to fill application form. No option should be left blank in the application form of BHU PET application form 2019. 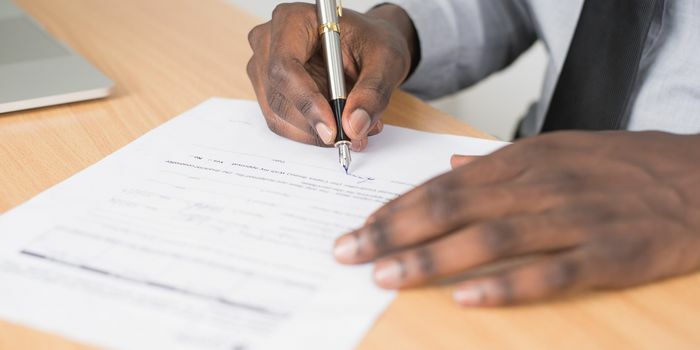 Candidates must also ensure that they fill the details in the form correctly, since requests for rectification will not be entertained after final submission of the form. Candidates need to first visit BHU PET 2019 portal on the homepage and click on “Apply for Admissions” button given on the page to start with the BHU PET application process. Once the candidate clicks on the link, he/she will see a registration form asking him/her for details. The candidate will need to fill details like name, DOB, email id, mobile no., etc., to register. Fields marked in “red” has to be compulsorily filled in by the candidate. Once he/ she has entered the details, the candidate needs to click on the “sign up” button at the bottom to complete the registration process. the registration process is a compulsory step which candidates will have to fulfill, else they will not be allowed to fill the BHU PET 2019 application form. 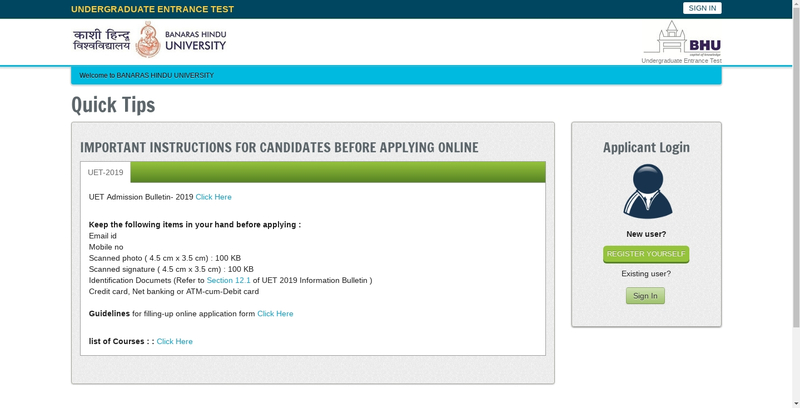 After the candidate has signed up, he/she will see a confirmation message displayed on his/her screen. Furthermore, he/she will receive an email on the email id given by him/her and a verification code on the mobile no. provided by him/her at the time of registration. The candidate will also receive an activation link in his/her email which he/she will need to click on to complete the registration process. Candidates must remember to activate the link, else their accounts will not be activated and the will not be allowed to fill the application form of BHU PET 2019. If the candidate has not received the confirmation link in his/her email, he/she should check the ‘junk folder’ or ‘spam folder,’ as the link may end up being in any of these two folders. If the candidate comes across an email from [email protected] in the “spam folder” or “junk folder,” he/she should mark it as “Not spam” and add this email ID to his/her contact list. In this way, he/she will be able to receive further emails from this ID in his/her primary inbox. Once the candidate clicks on the activation link, he/she will be directed to the validation page. In the validation page, the candidate will have to enter the validation code as sent on his/her mobile number. Successful validation will complete and confirm candidate’s registration with BHU PET 2019. The candidate will be allowed login, and he/she will now be taken to authentication page. Upon successful validation, the candidate has to login. Upon logging in, he/she will be directed to the authentication page where his/her identity will be authenticated. Candidates are to fill in all the details in the authentication page. The authentication process needs to be completed by the candidates to be able to fill the BHU PET application form 2019. Candidates having Indian citizenship and owning Aadhaar card except for Assam, Jammu and Kashmir, and Meghalaya residents need to enter their Aadhaar number in the form. In case a candidate has applied for updation of Aadhaar card/Aadhaar card but has still not received updated Aadhaar/Aadhaar card need to enter the fourteen-digit Aadhaar enrolment ID/ update request number with slash ('/') printed on Aadhaar enrolment slip/update request slip. Assam, Meghalaya, Jammu and Kashmir residents owning Aadhaar card are to enter only Aadhaar details during the authentication process while filling the BHU PET 2019 application form. While those residents of Meghalaya, Assam, Jammu and Kashmir owning no Aadhaar card has to fill their passport no./bank account no./ration card no./any other valid government identity mentioning their address. Such candidates have to carry and furnish the same document along with the BHU PET admit card to ensure their entry in the exam hall. While the candidates who have filled their Aadhaar card details have to carry Aadhaar cards and admit card to the exam hall. Indian citizens need to select the option ‘Indian’ in the ‘nationality’ drop down box. Candidates need to select the state of residence as mentioned in the Aadhaar card. To fill the type of identification and identification number, candidates need to refer to the following guidelines. Candidates has to fill in vital details including name, DOB, and gender as mentioned in the Aadhaar card. After filling the above details, candidates have to type the security captcha in security pin box. Upon ticking the ‘I agree’ checkbox, candidates will submit the authentication details. After successful authentication, J&K, Meghalaya and Assam candidates will be able to fill the application form. Their identity will be verified in the exam hall. Candidates need to login with their registration ID and password to start filling application form of BHU PET 2019. After logging in, candidates will be taken to ‘My Application Section’. They will see a page titled “Status of Submitted Applications” displayed on the window. Candidate has to select the desired course type and course name they want admissions to. At this stage, candidates are advised to first go through the eligibility criteria of the course they want admissions to before they start filling the BHU PET 2019 application form. Candidate’s application will be cancelled even at later stages of admission if he/ she is found to be not fulfilling the eligibility criteria. After making sure that they are eligible for the course, candidates can start filling BHU PET application form 2019 by clicking on ‘add course’. Next, candidates are to go to the left panel. On the panel, candidates will find options like ‘applicant details,’ ‘upload photo and signature,’ ‘test centre preference.’ Candidates need to complete application form of BHU PET 2019 by clicking on each of the options and filling all the details asked. For applicants’ details, candidates have to provide details like name, parents’ name, phone no., address, and so on. After filling the details, candidates should click on ‘save while filling the BHU PET 2019 application form. Candidates will be asked to list exam centres where they want to take the exam in, in the order of their preference. Candidates will be now required to upload photo and signature of specifications specified below. They will need to click ‘Upload Photograph and Signature’ to upload the documents. At this stage, candidates are advised to carefully cross-check all the entered details by clicking on the “Preview Before Confirmation” button. Candidates are to change or rectify any detail they find incorrect. After making sure that all the details entered by the candidate are correct, he/ she can click on “I confirm the above” and “Confirm and submit” button to submit the application form of BHU PET 2019. After this stage, the candidate will no longer be able to edit the form. Candidates will now be shown a page which lists all the applications completed. They will also be asked to confirm a declaration. They have to select the applications they want to submit and click on the declaration after reading it carefully. Fee payment against BHU PET application form 2019 can be conducted both in online or offline mode. To start with payments, candidates need to click on “Make Payments” icon on the dashboard. The candidate will be now taken to a page where they will be required to to select the course/courses they want to apply and pay for. If the candidate chooses online mode, he/ she needs to click on “Continue for online payment.” The candidate has to make payments through payment gateway on BHU PET 2019 portal using credit card/debit card/netbanking. Candidates will be taken to a page where they can generate and download HDFC bank challan. Candidates can pay the cash by submitting the challan in any HDFC office on any banking day only during the banking hours. Following is a category-wise breakup of fees for application form of BHU PET 2019. Candidates will be able to see the updated fee payment status within forty-eight hours of making the payment. Candidates can check the status of their BHU PET application form 2019 by going to “My Applications” button on the dashboard. If the candidates have successfully paid the fee and submitted the application form, the application status will show “entrance test fee paid” and “payment id column” will show payment id. Also, the ‘delete’ option will be no longer available to the candidate. This indicates that the candidate will not be able to delete his application anymore. 4. After successful application process, the candidate will receive an email stating that his/her BHU PET 2019 application form is successfully submitted. Candidates must take a printout of this email and retain it for future purposes. 1. The mode of application form of BHU PET 2019 will be online. 2. Candidates are required to correctly enter their details like name, DOB, address, contact information in the application form. 3. Candidates will get a BHU PET 2019 user ID and password which they must retain for further purposes. 4. All Indian citizens should own Aadhaar card issued by UIDAI. Candidates have to enter in details in BHU PET application form 2019 as mentioned in their AAadhaar cards. In case of any mismatch, the candidate will not be able to fill in his/her application form. Candidates are to ensure that the details mentioned on their school records match with the Aadhaar details. Q. What is the mode of submitting BHU PET 2019 application form? A. The mode in which application form is released is online. Candidates are required to first register themselves with BHU PET 2019 portal to fill the application form. However, the mode of payment is both offline and online. Q. What documents have to be uploaded by the candidate to complete his application form of BHU PET 2019? A. He/she is to compulsorily upload scanned passport size photo and scanned copy of signature. Q. Can a student still studying in final year of graduation apply for BHU PET 2019? A. Yes, such candidates are allowed to fill the BHU PET application form 2019. But such candidates have to produce the original marksheet on the day of BHU PET counselling or sign an undertaking that they will present the documents by October 31, 2019. Also such candidates need to make sure that they have scored at least 50% as an aggregate of all the exams taken so far. Q. Does an applicant have to fill different application forms if he/she is applying for more than course? A. No. He/she has to fill only one BHU PET 2019 application form to apply for more than course. Q. What will be the last date to fill the application form of BHU PET 2019? A. The last date to fill the application form was March 16, 2019. Q. Do candidates need to fulfil the eligibility criteria to fill the BHU PET application form 2019 successfully? A. Yes. It is necessary for candidates to fulfil the eligibility criteria to fill the application form. The application forms of ineligible candidates will be out rightly rejected. Also, admissions of eligible will be forfeited even if they happen to qualify the entrance test.